The number of deaths from exposure has increased; 37 people died last year. 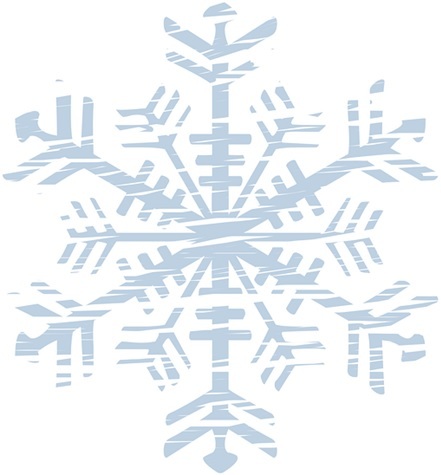 We use 100% of these funds to intervene in emergency winter situations. You are invited to meet people who have benefited from the program and some of our caseworkers in February for a home cooked meal. Please donate at least $200 or become a recurring donor of any amount to attend the Brunch. South Reno location shared with donors. Participants can request the same bed the following night when they checkout in the morning. Nightly service gives people a safe, warm place to sleep – upgraded beds from last year. 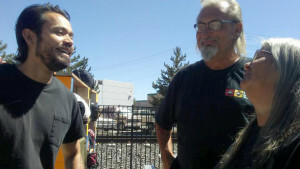 Actionn, VOA, and City of Reno host the Emergency Shelter and need volunteers. Put your team together to signup for one or more nights. 2018 Fall Update. Winter is coming. If you are interested in directly contributing to solutions, please reach out to learn about training schedules, emergency preparation, and to connect with other volunteers who make a difference by working together. 2018 Spring Update. We have about a dozen people receiving housing vouchers and are saving to purchase our own property. Voucher recipients spend twenty or more hours per week volunteering on our other projects. They work to develop skills, increase their resource circle, and stabilize their situation. Housing volunteers needed: It takes three people working together to help a neighbor get back inside by navigating the system and finding a home. You can attend our next training and connect with other volunteers to help people change their circumstances with community: Learn More. Thank you to everyone who served during the 2017-18 Winter. Please message if you would like to be part of this emergency response. You can also share the current video with your team and sign up to volunteer. Closing words: “These folks are our neighbors. They are resilient. They are compassionate. They’re strong. They’re smart. They’re human just like you and me. They’ve just run into circumstances… Take a moment to look at the vulnerabilities and the power – who has it and who doesn’t in this scenario… it’s apparent that they are in much more need of protection than you are, so you do have a lot of power… They are the vulnerable ones. Treat them with dignity, respect, with kindness just as you would your neighbor. ACTIONN and the City of Reno partnered to operate a second overflow in 2017 to keep people safe in winter while longer-term solutions continue to be explored. 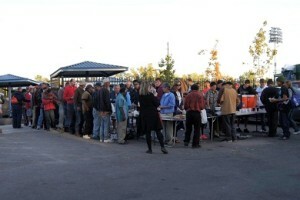 Before winter, both the shelter and overflow reached capacity. Volunteer staff were utilized to oversee operations at night. Churches and organizations signed up for particular nights. Please use the handout to show the need for additional supports in our region and to recruit people in your organization to help with the additional overflow. Living Room is RISE’s longterm housing effort. We are out there making a difference today while developing long-term solutions for everyone affected by our region’s housing deficit. 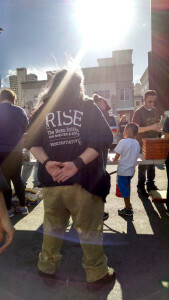 RISE volunteers provide case management for about a dozen people. Case managers help people find and maintain housing. In the short run, we are matching donors with families, providing vouchers from general funds, helping people apply for other local resources, and making strong community friendships. We meet family needs to keep people inside. This is a front line effort with many contingencies. We are ready to run a 24/7 facility. Families will do better when we can give them space outside of the weeklies. If you want to support these efforts, request our detailed program, budget, or schedule a presentation to a group that can help us serve more people, please email us and donate. David wakes up every morning at 5am, assuming he got any sleep the night before. If he is lucky enough to work that day, he can expect to be on his feet for up to 12 hours including his walk to and from the jobsite. He makes sure that his two chihuahuas Clyde and Tinkerbell are awake and dressed appropriately for the day before he collects his belongings, cleans up the area, and starts his long walk to meet his wife Meli. Meli is typically woken up at about 6am. If she was lucky, she was able to get a decent night’s sleep on a bedroll as opposed to sitting up at a dining room table. She asks the staff for access to her medication before she packs up her belongings onto her walker. As she makes her way outside, she can’t help but exude a faint ray of joy. She has plans this morning, special plans. David was able to save up a little bit of money from odd jobs and they’re going on a breakfast date. They might even be able to catch a movie later in the afternoon. As she makes her way to the street corner to look for David, she thinks about all of her favorite breakfast foods and tries to decide which plate would give her the most bang for her buck. She hears the familiar sound of paws tapping on the sidewalk as her furry children run to greet her a good morning. As she reaches down to pick them up and put them on her walker, she hears David’s laughter from a distance. She loves him, but just as fast as her heart was filled with happiness it quickly turned to dread at the sight of him carrying all of their belongings. She knew what they looked like and how everyone would treat them on their special day. What if security gives them problems like they did last time? What if they are outright denied services? What if today is just another day of being houseless in Reno? David and Meli have been living on the streets for a little over two years. Their descent into poverty started about five years ago when David was hospitalized after having the first of three strokes. The medical emergency cost him his job and eventually his home. Like most people with health issues, difficult decisions kept them up at night and sacrifices were made. They had downgraded every aspect of their lives but still couldn’t manage to make ends meet. After three years of selling what possessions they could, accepting lower paying jobs, and moving from place to place to avoid rising rents, they eventually ended up on the streets. David and Meli should not be on the streets nor should anyone for that matter. Normally the above attributes would be considered strengths, but for David and Meli these strengths have disqualified them from public assistance and access to emergency shelter.  Understandably, the shelter in Reno/Sparks does not allow couples without children to stay together nor do they allow animals in the residence hall without the mandatory paperwork. These requirements are for the safety of all the staff and residents involved, but for David and Meli it presents a difficult choice: who is going to sleep outside tonight? Unless David is sick, he spends a majority of his nights outside watching over their dogs and all of their belongings. During the day, he trades shifts with Meli while he either works a temporary job or looks for steady employment. David explains that one of the greatest obstacles to climbing out of houselessness is that simple tasks can be an all-day ordeal for him. 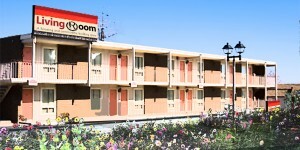 For example, bathroom and laundry facilities are only accessible during certain times of the day. Without transportation, David has to plan every hour of his day very carefully otherwise he risks missing his appointments. He tries very hard to disguise his situation from his employers or prospective employers, but more often than not he arrives for work exhausted. When he is able to secure work, it is difficult for them to save enough money to get an apartment. With most of the long term affordable housing options at capacity, David and Meli turn to the market for relief. However, most rental units require a deposit, first and last month’s rent up front, a pet deposit, proof of long term employment, and proof of reliable rental history. These requirements, combined with record-breaking rental prices in Reno/Sparks, make it nearly impossible for them to afford an apartment even if they can save enough money to get through the door. This is the problem with the poverty trap; the longer you are in it, the harder it becomes to break free from it. If you cannot afford to establish rental history and you have long periods of unemployment on your résumé, you are less likely to stabilize and become independent. We, as a society, have determined that if a person is houseless it must somehow be their fault. And the longer they are out there, the more it reaffirms our belief that they are unwilling or unable to participate in society and should stay where they belong. 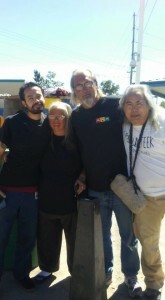 David and Meli have been volunteering with outdoor meal providers for years. David and Meli’s story is not unique. In our experience, many of our unsheltered neighbors are fully capable of being independent but are stuck in the same poverty trap. Though job opportunities, workforce development, and case management rank among the top five requests from our houseless population, housing always ranks number one. For our transitional houseless population that do not qualify for public assistance, or worse, do not know that they qualify for assistance, getting off the streets is the first step towards independence. Once placed in a stable environment, they can begin to escape the tyranny of the moment and plan for a sustainable future. We will target low income adults (0-50% AMI) ages 18 and over who have fallen through the cracks of our public assistance system. Once a person is approved for a Living Room voucher, they will be assigned a case manager who will help them find temporary housing and other qualifying resources. Additionally, they will work with an employment specialist who will assist them in securing employment. Depending on each person, the length of the voucher will be from 3 – 8 months until they can assume rental payments themselves. We will be extremely selective in choosing people to sponsor with a focus on those who are employable, awaiting public assistance to commence, or who are actively involved in community-building. While we are fundraising for housing vouchers, we will be saving to secure a long-term lease or purchase a spacious home. If by November 1, 2016 we are unable to secure property, we will accept applications for Living Room housing vouchers. Once we can secure a long-term site, then we will host as many people as comfortably possible. RISE will master lease the Living Room site and will sub-let to each resident using the residual income approach, assuming they have any income at all. However, our priority will not be collecting rent. Without the pressure of assuming rental payments in 4 – 8 months, people can focus on healing their psyche and begin rebuilding their lives. We will host numerous workshops to help people recover from the trauma of poverty, including pet therapy, garden therapy, art and music therapy, yoga therapy, and culinary therapy. Additionally, we will offer workshops on basic financial management and home economics. The residents will be responsible for the cleanliness and appearance of the Living Room based on a weekly shared-responsibilities schedule. As with any workplace, there will be room for advancement to include title promotion and, if possible, paid positions. Residents may also recommend new community service projects for RISE to undertake. The Board will review the project for feasibility and, if approved, the person will be heavily involved in the planning, implementation, and operation of the new project. Involved people develop a sense of ownership through community service. They will develop marketable workforce skills while achieving health and well-being. Their tenure in the Living Room will serve as a place to heal and as a place to establish both rental and employment history. Understandably, many will be anxious to find employment and move out on their own once they are stabilized. We strongly encourage and promote them to do so. We will work with those residents to help develop their résumé and provide letters of recommendation. We will also ask graduating persons to participate in replacing themselves in the organization and assist us in actively recruiting for the next sponsorship. As time moves forward, we expect that some of our residents will find employment but would prefer to stay at the Living Room. Once it has been firmly established that the current residents can be responsible for the maintenance and financial management of the property, we will transfer the property into a community land trust or help them form a workers collective to own and operate the home. Then the RISE team can find another property and replicate the model. David and Meli are faithful volunteers at RISE and Dine on Saturdays. We are happy to announce that at the time of this publication, David and Meli have been off the streets for about two months. As the first recipients of a Living Room voucher, we are honored to witness their transformation back into society. David has secured steady employment and is on track to take over rental payments in the next few months and Meli will likely be awarded Social Security Disability Income due to her decreased mobility. David explains that even in their darkest moments, there was still a faint ray of hope that kept them going. They refused to give up on themselves or their fellow man, and they did not allow their circumstances to compromise their integrity or their morals. As their situation begins to stabilize, their path to retirement is no longer a distant dream or fuzzy idea to keep them warm at night but is becoming a concrete reality. 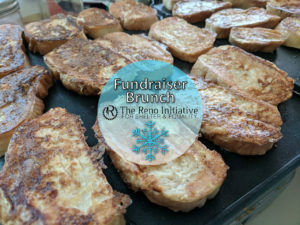 For the past five years, we have depended solely on the generosity and compassion of the good people of Northern Nevada to fund the RISE and Dine, Free Market, and Giving Garden projects. With your help, we’ve been able to serve tens of thousands of home-cooked meals, distribute thousands of clothing and hygiene items, and harvest hundreds of pounds of local, organic vegetables for our neighbors without homes. When we first started the RISE and Dine project, we had no idea what to expect or how to guarantee success. We heard every criticism imaginable from “You’re wasting your time” to “You’re not helping anybody.” But we had faith in our community and knew that if our cause was just, we would persevere. We believed, and still do, that no person is ever too far gone. That no one should be abandoned to a life of despair and loneliness. Everyone has a purpose in our world that is meaningful. Even if we could make the smallest impact in one person’s life, it would have been worth it. As we embark on our latest journey, we need your support now more than ever. We appreciate constructive criticism, free advice, or any other resources you are willing to share. Please see the link below if you would like to contribute to our campaign or feel free to contact us if you would like to make an impact together. Remember to tell your friends. November 1st, 2016 we will use the greater of $3,000 or 10% to move people inside. If we have raised $23,000, we will lease a residential home for up to eight people (budget available by request). Full time staff to provide case management in a facility for twenty or more people in a leased or purchased building (budgets available by request). Example rendering of a possible site for 20 or more people.